Protesters hold banners as they march during a "Rise for the Climate" demonstration in Brussels, Belgium, Jan. 27, 2019. 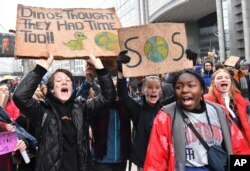 At least 70,000 people braved cold and rain in Brussels to demand the Belgian government and the European Union increase their efforts to fight climate change Sunday, the Belgian capital's fourth climate rally in two months to attract at least 10,000 participants. The event was described as Belgium's biggest climate march ever, with police estimating slightly bigger crowds than a similar demonstration last month. Trains from across the nation were so clogged thousands of people didn't make the march in time. The march ended at the headquarters of the European Union. The 28-nation bloc has been at the vanguard of global efforts to counter climate change but still came in for the protesters' criticism. “Society as a whole could do a lot more because they're saying `Yes, we're doing a lot,' but they're doing not that much. They could do a lot more,” demonstrator Pieter Van Der Donckt said.